You can add other aromatics, like cinnamon, cloves, a slice of lemon, or others; and you can swap out tea for the hot water. It basically sounds like other home cure remedies for colds, except with a shot of whiskey. Here’s a little factoid that might put a smile on your face… it’s called a “hot whiskey” in Ireland and the “toddy” comes from a drink made in India. A toddy is made by fermenting the sap of palm trees! Pour the whiskey and honey into a mug then fill with a 1/4 cup of water, dissolving the honey into the mixture. You can add a few teaspoons of lemon or replace the water with a nice hot tea. Avoid the flavored teas as it’ll confuse your palate, but your favorite tea should suffice. This entry was posted in Cocktails by Jim. Bookmark the permalink. Great recipe! Only trouble I had was considering that most of the ingredients aren’t hot, it’s not a very hot toddy. Any suggestions on how to make it hot without having the alcohol evaporate off? We used to be given this as children, but with lemon and sugar, instead of honey so it was sharper…but no less tasty! 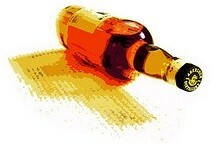 How can a scotch addict spell whisky with an “e” ! That does not work because if it is Scotch the it is whisky.